Modern contraceptive services and maternal and newborn health care are essential for promoting the well-being of women and their babies. Contraceptive use enables women and their partners to plan the number and timing of their children, and access to maternal and newborn care greatly improves women’s chances of having a healthy pregnancy and delivering a healthy newborn. Providing a comprehensive package of maternal and newborn care that includes antenatal, delivery, postnatal, HIV-related and postabortion services is costly and can pose a challenge for low-income countries. One way to manage such costs is to reduce the number of unintended pregnancies—those that occur among women who want to postpone pregnancy or stop childbearing altogether. As of 2017, women in Nepal have an estimated 1.2 million pregnancies each year, of which 539,000 (or 45%) are unintended. Nearly a quarter of these unintended pregnancies end in unplanned births and two-thirds end in induced abortion (and the remainder end in miscarriage). About 44% of women aged 15–49 who want to avoid a pregnancy have an unmet need for modern contraception, meaning they are not using contraceptives at all or are using a traditional method. Most unintended pregnancies result from unmet need for modern contraception. Unmet need is substantial in every province of Nepal. It is highest in Gandaki Pradesh (experienced by 52% of women wanting to avoid a pregnancy) and lowest in Province 2 (38%). Many pregnant women in Nepal do not receive the maternal and newborn care they need to prevent and manage health complications that may arise during pregnancy and delivery. Maternal mortality in Nepal, estimated at 239 maternal deaths per 100,000 live births in 2016,2 is higher than average for the Southern Asia region.3 This mortality ratio translates to the death of approximately 1,600 women each year. Satisfying all women’s need for modern contraception would increase the annual cost of services from an estimated $18 million (in 2017 U.S. dollars) to $33 million. This total would include contraceptive commodities, staff salaries, health infrastructure upgrades, contraceptive counseling, communication activities, and improvements to programs and systems. If contraceptive services were to stay at current levels, providing all 1.2 million pregnant women each year with a comprehensive package of maternal and newborn health care would cost $135 million—about one-fourth of which would cover care for women with unintended pregnancies. This represents more than a doubling of the current cost of care. Because having an abortion or carrying an unintended pregnancy to term is more expensive than supporting women to prevent unintended pregnancies in the first place, expanding modern contraceptive services and maternal and newborn care simultaneously would result in cost savings compared with expanding maternal and newborn services alone. For every additional U.S. dollar spent on expanding modern contraceptive use, the country would save $2 on maternal and newborn health care. 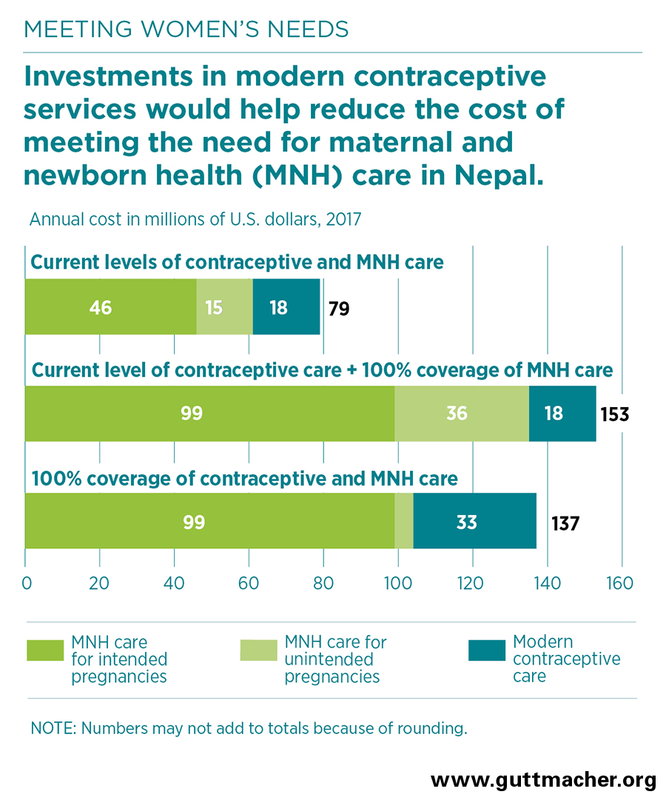 Providing modern contraceptive services and the recommended maternal and newborn health care services to all women who need them would cost $137 million: $33 million for contraceptive services and $104 million for maternal and newborn care. The country would save nearly $17 million because of the unintended pregnancies that would be averted. Under this scenario of fully meeting women’s needs for these services, Province 2 would see the largest cost savings ($5 million), while other provinces would save between $0.7 million and $4 million each. An effective strategy for managing the cost of full maternal and newborn health care coverage while also reducing maternal and infant death and disability is to lower women’s exposure to the risks of unintended pregnancy and childbirth in the first place. Various stakeholders share responsibility for meeting the demand for modern contraceptives: local and provincial governments, the national government, the private sector and international development partners. 1. Special tabulations of data from Guttmacher Institute, Adding it up: the costs and benefits of investing in sexual and reproductive health, Fact Sheet, 2017, https://www.guttmacher.org/fact-sheet/adding-it-up-contraception-mnh-2017. 2. Nepal Ministry of Health, New ERA and ICF, Nepal Demographic and Health Survey 2016, Kathmandu, Nepal: Ministry of Health, 2017, http://dhsprogram.com/publications/publication-fr336-dhs-final-reports.cfm. 3. World Health Organization (WHO) et al., Trends in Maternal Mortality: 1990 to 2015: Estimates by WHO, UNICEF, UNFPA, World Bank Group, and the United Nations Population Division, Geneva: WHO, 2015. 4. Cleland J et al., Family planning: the unfinished agenda, Lancet, 2006, 368(9549):1810–1827, doi:10.1016/S0140-6736(06)69480-4. This fact sheet was made possible by UK Aid from the UK Government. The views expressed are those of the authors and do not necessarily reflect the positions and policies of the UK Government.